ASI’s Online Ordering Service (OOS) provides you with an intuitive, web-based system that streamlines the complex process of ordering incremental signage. OOS contains a complete online catalog that has been configured to the client’s exacting brand and signage guidelines. As companies expand and evolve, the integrity of their brand program lies intact with our online order system: there’s no need to review a complex sign manual. Simply choose the sign type you need, input the message and quantity and order directly from the web. No illustrations or specifications are required. It’s all been taken care of to ensure you can focus on your business and leave the signage to us. This proprietary system provides an intuitive way to manage your brand identity and categorize your signage by location, division and sign-type. 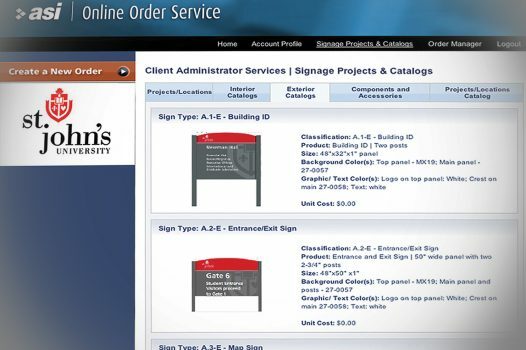 ASI’s Online Ordering Service (OOS) provides you with an intuitive way to manage your brand identity and categorize your signage by location, division, and sign-type. ASI’s Global Account Management (GAM) documents all aspects of highly complex projects and organizes all program information into a single, centralized web-based system. The system provides real-time access to your overall program progress, project status, and offers the ability to drill down for specific project documents and data. This proprietary system provides unique capabilities that are unparalleled in the industry to help streamline large-scale and complex projects. 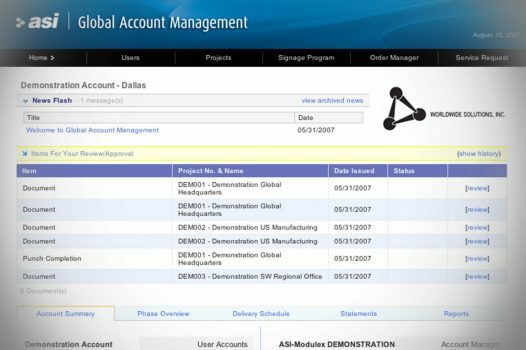 ASI’s proprietary Global Account Management (GAM) system provides unique capabilities to help streamline large-scale and complex projects.